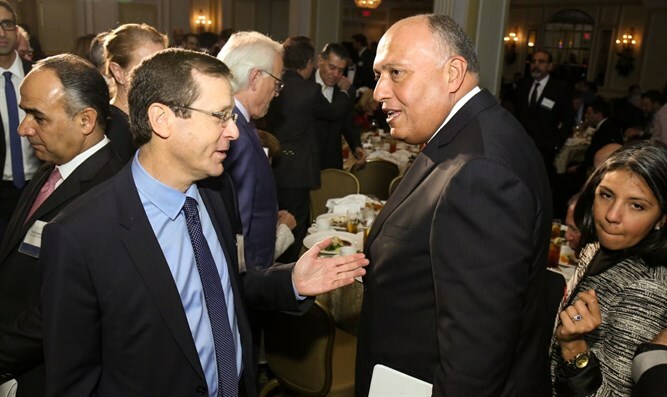 Opposition head and leader of the sinking Zionist Union party Isaac Herzog said at the Saban Forum in Washington that he hopes President-elect Donald Trump will be "active in achieving regional order" in the Middle East. He also said US partners in the Middle East "want to know where she stands in all areas," especially in wake of the recent elections. Herzog also said, "The current US government is without a doubt the most powerful in the world, and its reign in the Middle East is coming to an end. There is a general feeling in the Middle East that the US is someone whose standpoint has wavered." "Although the US has contributed a significant amount to Israel's security, the countries who see themselves as partners of the US have been disappointed in America's decisions from the past few years, and would like to know now what the US stance is on several important issues in the Middle East," Herzog explained. "Foremost among these issues are the Iran deal, the war with ISIS, the Syrian civil war, the Israeli-Arab conflict, and others." Herzog also mentioned Avigdor Liberman's (Yisrael Beytenu) suggestion to wait on the Regulation Law until Trump enters office, saying he agrees with Liberman and thinks surprising the US at this point in time could be very detrimental. "Israel and the US must agree on a single clear policy regarding these issues, one that will support 'two states for two nations,'" Herzog said. He also mentioned Monday's upcoming vote on the Regulation Law, saying the entire opposition would turn out to vote against the law. "Anyone who thinks Trump's election allows the Israeli government to do whatever it wants, is making a severe mistake. Especially now, when we are about to have a new US government, Israel needs to make its own decisions about separating from the Palestinians," he told the forum. "Israel needs to decide if she is going to leave the two-state solution behind, with all the consequences of such actions, or if she will make the brave decision and sign the historical agreement which will lead to the creation of two states, peace, and security." Regarding the US' role as a superpower, Herzog said, "In light of the changes in the Middle East's balance of politics and power, the US needs to be more active, and in certain situations must be ready to use force and show she knows how to use force, despite the trauma in Iraq." He also said there would be those who would try to test the new president's power, and the US must show they are not afraid of threats.